We are pleased to announce the arrival of our latest addition to the Eglu family. It is a good size and has a healthy colour, and we’ve named it the Eglu Go Hutch. Click here to see the first pictures. With the best features of its siblings the Eglu Go and the Eglu Pet, this new Hutch combines style, practicality and ease of use. It is child-friendly (though we don’t suggest putting your child in it), and it is ideal for housing two guinea pigs, 1 dwarf rabbit or even a tortoise. Designed to enable pets to express their natural instincts, it offers a fun environment that will make them feel really at home. The Eglu Go Hutch offers two main areas for your pet to explore. The house is a wonderful hidey-hole to eat, sleep and snuggle up in, and the secure 1m run is perfect for a run around and for getting some fresh air. The biggest benefit of having a hutch and run in one is your pet’s freedom to go in and out as it pleases, making it happy, relaxed and easier to handle. 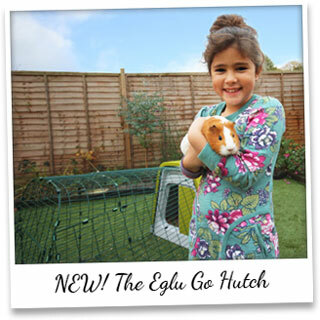 The Eglu Go Hutch is in stock and you could have it delivered as early as next week. Are you one of the 1.45 million people that have watched this eggstraordinary video? We did, and we couldn’t believe our eyes! 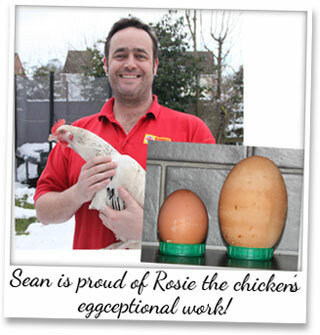 The YouTube clip, which has gone viral, features Eglu Owner Sean Wilson showing off his chicken Rosie’s humongous egg. He puts his frying pan on the hob and cracks the giant egg, ready for his megga sandwich, when he discovers something amazing…an egg within an egg! His reaction is amusing to say the least. Rosie’s egg has appeared in nearly every newspaper, and at almost 10 inches in circumference and weighing 181g, it is easy to see why her laying has become so famous. See the egg being cracked open here, and if you fancy a shiny Red Egg Skelter like the one in the video you can buy one here! Fancy living the good life in the city? It can be done, as Clare Rogers explains in an article for Baby London Magazine this month. Clare keeps chickens in the back garden of her terraced home in London, and in her words “they are, frankly, the best pet ever”. Her neighbours may have been surprised at first, especially after finding an escapee in their own garden, but over the last 8 years the number of chicken keepers in London has risen and risen. 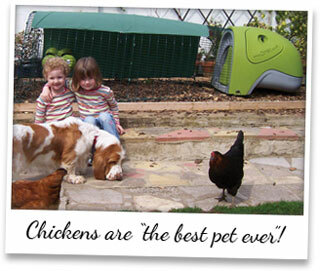 So, what does make chickens great pets? Clare says that they are tame, fluffy and don’t mind being stroked, and of course, they lay eggs. It takes her just five minutes a day to look after them and her kids love them. Read the full article here! And if you’re interested in keeping chickens why not go on a course, where you can see an Eglu, handle a chicken and ask any questions to have. Click here to find one near you!